Since the psychologist Maslow first published his 'Hierarchy of Needs', there has been some acceptance that as individuals, as groups and as a species, so our focus in life depends on our needs at that time: we cannot allow ourselves to examine our emotional requirements, let alone more esoteric desires, until our needs for food, shelter and safety have been met. The trouble is, bits of our brain are still locked into this way of thinking. Even though most of us in 'the west' have food and shelter, the remnants of our animal minds still behave with 'fight or flight' mentality. Or rather, they do if we allow them to! What more and more individuals are realising is that we do not have to be slaves to this part of our conditioning. We can actually choose to co-operate rather than confront. We can decide to live with our fellow man (of different religious background for example) rather than fight him . . . and, getting back to the fox hunters, we can choose to respect the animal world and treat them as 'co-inhabitants of our shared countryside' rather than hunt them. It's not a matter of what's intellectually 'right' or 'wrong' and it's not an emotional reaction to the chase and it's results . . . it's about looking deeper into our minds and our underlying reasons for doing, or not doing something. How does it rest with our soul? With thanks to Dan Millman's The Sacred Journey of the Peaceful Warrior. 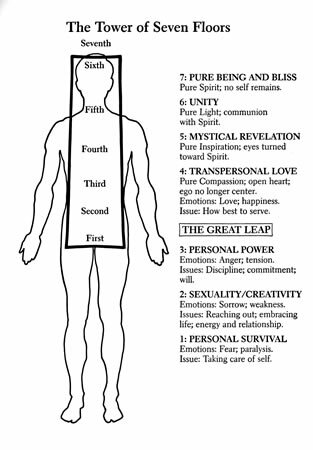 Many of those on a journey of personal or spiritual growth are familiar with the ideas of chakras, how we have different levels of our being in which we can get 'stuck'. In a very similar way to Maslow's hierarchy we need to be able to face and rise above our survival fears (level 1), we need to acknowledge and embrace our sexuality (level 2). . . and we need to be able to feel and work through our anger (for example - level 3) before we can truly be our own true self. Once we are at peace with our minds and bodies, then we can reconnect to the rest of humanity: we can explore the divinity within all things and immerse ourselves in it (levels 4 to 7). In my work I have met many individuals who see that it is time for them to face reality. Such men and women are part of a growing proportion of humanity or are accepting that the world we live in is of our choosing . . . and that we, each and every one of us, is responsible for it. We now KNOW that we, as individuals, contribute not just to global warming through our energy excesses, but also to the prevailing atmosphere of mistrust and selfishness. The good news is that with some support and encouragement we can trace the roots for these traits within ourselves . . . back to our own early life. We can forgive our parents for how they might have treated us, we can acknowledge that we have been spoilt . . . and work to accept and love others as much as ourselves. Such trends are real. 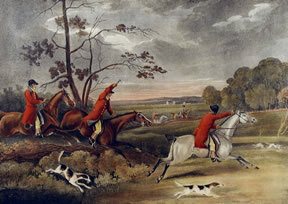 The lack of their traditional sport will give many who have hunted in the past an opportunity to reassess their lives . . . to leave behind the 'hunter-gatherer' that's in their blood and genes and instead listen to their soul . .. that inner divine voice. Not too many generations ago we (humans in what's sometimes called the 'developed world') had a hard life. Just to eke out enough food or earn enough to live on was all many families could manage. This was probably true even of my parents early lives, brought up in English rural communities. Life was, of necessity (as it still is in many others parts of the world today) about the day to day tilling of the land and routine tasks that HAD to be done to survive. In such an environment there was little time for intellectual debate and, particularly after Victorian conventions became the norm, little inclination for a 'heart to heart' or emotional sharing. In just one life-time, I've changed all that. Through the provision of education and the stability of this family background, I've been able to face this past, see it for what it is . . . and move on. This life of mine has given me the opportunity to 'take stock', to opt out of the expectations of my family's conditioning and see what I might call a 'higher truth'. Through involvement in various arts (stage work, writing, etc.) I've broken free of my unemotional upbringing. Through my ability to feel and express my emotions I've left behind my practical and intellectual pasts to see how mind and body are vehicles for the soul. Whereas the world of my parents and grandparents revolved around their own small village and family groups I'm able to see the world, the earth, and all that are part of it as 'The One-ness', an interconnected energy . . . which flows best when we accept. Yes, previous generations of Beasleys and Kerbys worked hard, succeeded in many important ways and loved each other as best they were able . . . in the context of the world of their time: separate, isolated, restricted to the mundane and local. Those days are gone and we have to have a way of thinking that reflects the global nature of human society . . . but that DOESN'T have to mean being swept along by the corporations and their material idols. These are not real. We do not need them. What we DO need . . . if you look at both the Maslow and Chakra views . . . is to love and be loved, so be able to face our own weaknesses and rise above our fears . . . to reach out and recognise that we, all of us on this planet, are in this together. It's time to rise above our animal and territorial heritage, to use our huge mental and emotional capacities to embrace each other . . . not fight or hunt each other. All this is, I have to admit, just my perspective. But I hope it's given you food for thought. Maybe it has helped you to see how you have changed during your lifetime? . . . or how your ways are different from your forebears . . . or how we, as a species, really are evolving. If you'd like to pursue any of the issues raised, or to explore your own 'evolution' do please contact me via the response form.